Smoking has been used as a way to preserve meat and fish, but it also adds a rich, intense flavor to food. The smokiness can come from oak, apple, birch, maple or hickory wood to create varying flavors. Meat and fish are typically cured before smoking. Haddock, a mild white fish, is a healthy food to smoke. When smoked, it can be eaten as a main dish, or it can be added to soups, salads and chowders. Cure haddock fillets using a dry cure. Mix 3 cups of salt and 1 cup of sugar. Add other spices and herbs, if desired, such as pepper and garlic. Rub thoroughly all over the fish to coat. Wrap tightly in plastic wrap, place into a deep dish and refrigerate for 18 to 24 hours. Drain off any liquid that accumulates in the dish. Cure the haddock in a brine. Add 3 cups of salt and 1 cup of sugar to 1 gallon of cold water in a large pot. Other seasonings or herbs such as pepper, bay leaves, garlic or sage can be added to the brine to add more flavor. Place the haddock fillet in the brine, cover and refrigerate for roughly 14 hours. Brining can be done anywhere from six to 24 hours. Rinse the cure off the haddock under cool running water. 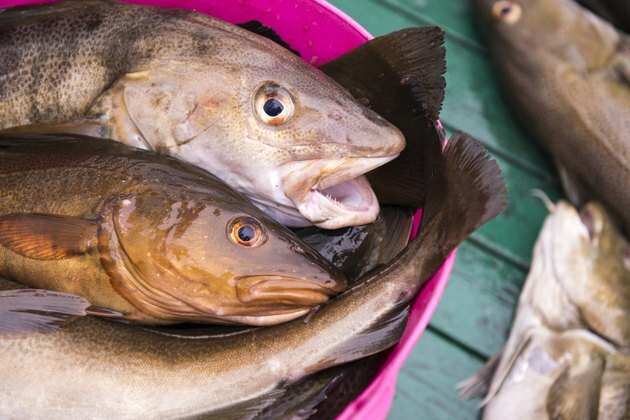 Place the haddock skin side down in a cool, breezy location for the fish to dry. Put the haddock in the smokehouse on racks to dry, for convenience. Dry for 2 to 3 hours or until a pellicle forms, a shiny skin-like surface. This is to help keep natural juices in the fish while it smokes. Put the haddock fillet in a smoker at 90 degrees F for 2 hours. Increase the temperature to 150 degrees F and smoke for another 6 hours per 1 inch of thickness. Test the haddock with a fork. It is done if it flakes easily. Store the smoked haddock in the refrigerator for up to 2 weeks. Brown or white sugar can be used for the brine; brown sugar will be a little sweeter. Weigh the fillet down with a plate or small bowl to ensure it is submerged in the brine. Freeze the haddock right after smoking if you want to preserve the fish for more than 2 weeks. What Is the Best Way to Cook Monkfish?